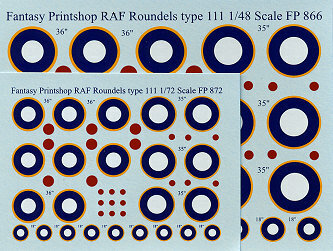 Price FP-866 is £3.95, while FP 872 is £3.95. This particular variety is listed as type 111 and is the type used on the fuselage side. The yellow surround was part of the close-in ID marking that was initially used early in the war on the larger roundels. Each sheet has a variety of standard sizes that will make the sheet quite useful. The 1/72 sheet is FP 872 while the 1/48 sheet is FP866.